In Germany, in Triassic sediments 240 million years of age, found fossils of reptiles, with the unmistakable signs of turtles. This animal called Pappochelys rosinae, in its morphological structure and lifetime – a real intermediate form between primitive reptiles and turtles. In Pappochelys abdominal ribs were flattened, and in some places are connected, so that the likeness formed plastron; these edges also have a flat top surface, marking the beginning of the formation of dorsal armor. Interestingly, this animal skull appeared diapsidnym with two temporal arcs, whereas modern turtles it anapsidny having no temporal arcs. This finding confirms the molecular phylogeny of turtles, tortoises are placed in one branch with the lizards (Diapsid). If the reconstruction will be believable (and they will still be critically discussed), the classical ideas about the evolution of reptiles will be reviewed. German paleontologists Rainer Schoch (Rainer R. Schoch) from the State Museum of Natural History in Stuttgart and Hans-Dieter Süss (Hans-Dieter Sues) from the Museum of Natural History in Washington, described a new species of fossil skulls (Fig. 1). They named the turtle extinct Pappochelys rosinae, pointing directly and on its importance for science, and some of the historical details of its study. Historical details are hidden in the name of the species – it is given in honor of Isabelle Rosin (Isabell Rosin), which masterfully all the prepared fossils, including a relatively complete skeleton, which became standard (Fig. 2). Thus perpetuate the name of the preparator, scientists partly reflect the time-consuming and painstaking process, which is required for the study of fossil remains from the time the discovery in 2006 of nineteen fragmentary skeletons before the publication was 9 years old. The generic name is translated as Pappochelys grandfather turtles (Greek pappos – grandfather, chelys – turtle). Pappohelisa be called the grandfather, and because of his old age, and because of its morphological structure, ancestral turtle. The remains of this species were found in Germany, the layers formation Erfurt (Erfurt Formation) srednetriasovogo age (about 240 million years). It is 20 million years older than the fossil turtle Odontochelys, found in China in 2008, which is considered the oldest in this group (see . : Chun Li et al., 2008. An ancestral turtle from the Late Triassic of southwestern China). 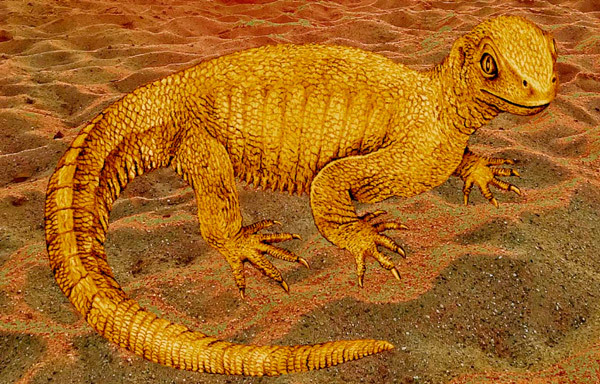 The alleged ancestor of turtles Eunotosaurus has an age of 260 million years (see . : TR Lyson et al., 2013. Evolutionary Origin of the Turtle Shell). 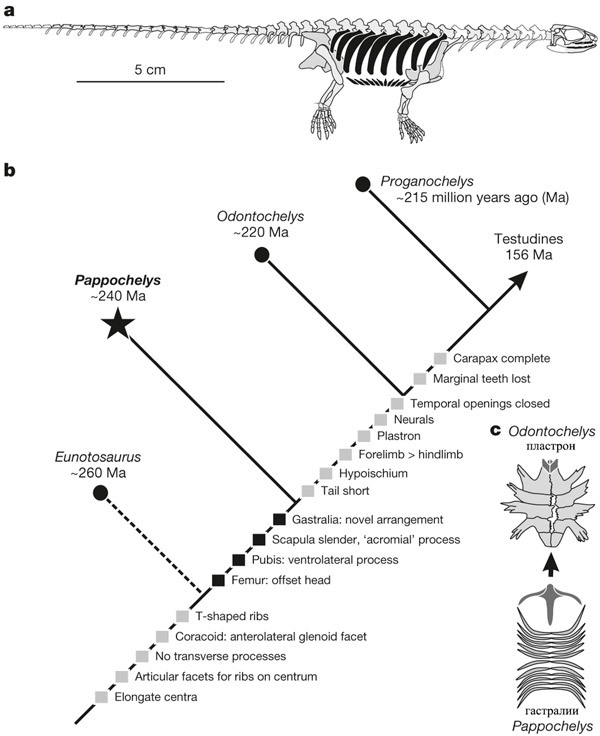 So pappohelis fit in time as the time between the hypothetical ancestor of turtles and specialized descendants. What to pappohelisa morphology, the researchers note several important, typically “tortoise” features. Firstly, we were pappohelisa abdominal ribs or gastralii forming part intergrown abdominal armor resembling plastron. Secondly, he had pectoral fins T-shaped: with the external, flattened sides are uneven, with a sculpture of the bottom side had thickened, rear (distal) end of the extended edges. These edges are typical of turtles, it can be considered precursors (along with other bone elements) dorsal armor – carapace. In addition, they have elongated trunk vertebrae and specific times of the forelimbs, including an elongated thin blade. Externally this animal looked like a lizard more than a turtle: small size (about 20 cm), with a long tail and a long neck, moving legs, it was relatively quick and, judging by the small blunt teeth on the jaws, it eats worms and middle-sized invertebrates. So, gather all the information on the morphology, which only can be removed from the disparate parts of the skeleton, the scientists calculated for pappohelisa place on the phylogenetic tree turtles. It is located between Eunotosaurus and Odontochelys with Proganochelys, and the evolution of the latter has led to a whole group of turtles (Fig. 3). So pappohelis – a real transitional form between primitive and specialized lepidosauria turtles. In pappohelisov half shell made and, accordingly, under the half-fitted shell skeleton limbs and their mounts. The authors believe that this kind of a skeleton with a prototype of the plastron could help these animals lead a semi-aquatic lifestyle, move on mild coastal sediments and swim – they were found in the layers of fossil lake. But the most interesting in the skeleton – the structure of the skull. All land animals on the structure of the skull divided into three groups: anapsid, Diapsid and Synapsid. In anapsid skull no one temporal pit, respectively any temporal arc; Diapsid in two temporal pit at Synapsid – one. Modern turtles on the structure of the skull are anapsid as extinct pareiasaur and procolophonidae. Therefore, comparative anatomy, bringing together with the extinct tortoises anapsid, considered their group branched from the trunk before reptilian lizards, snakes and crocodiles. When there was a molecular phylogeny, the turtle immediately moved above were among diapsidnyh reptiles with lizards. The war between molekulyarschikami and morphology led to the denial of anapsid as such at all (see. Turtles threatened to turn the evolutionary tree of reptiles, “Elements”, 11.22.2013). Like, anapsid, including turtles – it is overgrown with Diapsid temporal arcs. In support of this hypothesis, for example, find undoubted procolophonidae Australothyris smithi one temporal pit. One could even argue as much as necessary about the reliability of the molecular phylogenetic reconstructions, calculate the probability of a tree, has not announced pappohelisy with … two temporal wells. Skull pappohelisa really diapsidny. This once again confirms the obvious position that molecular data – that’s fine, but you can check them really only paleontological finds. Of course, to rewrite textbooks in zoology is not worth it. It should be ten times to test the findings of German experts. Naturally, scientists are brought up on classical notions of anapsid-Diapsid-sinapsidnoy phylogeny of land vertebrates, will criticize every detail reconstruction pappohelisa, each output of this work. Critical articles have appeared in the first day of publication in the light, surely the debate will be very hot. But to date, molecular phylogeny gave a truer and unambiguous results than comparative anatomy. Perhaps it should be the case with the highly specialized structure plans, such as turtles.